Disclosure: This post is sponsored by ALEX. I am an ALEX blogger and receive products for free. All opinions and experiences are my own - yours may differ. The Lil Divas have been begging me to teach them to sew for months. Confession - this Mama does not sew! I have been putting it off for fear that I could not teach them to do something I wasn't good at myself but I recognize that it's something very beneficial for them to know how to do. I think everyone should at least be able to fix a seam, hem or patch a rip (thankfully I can do that if I really have to!) in a pinch. 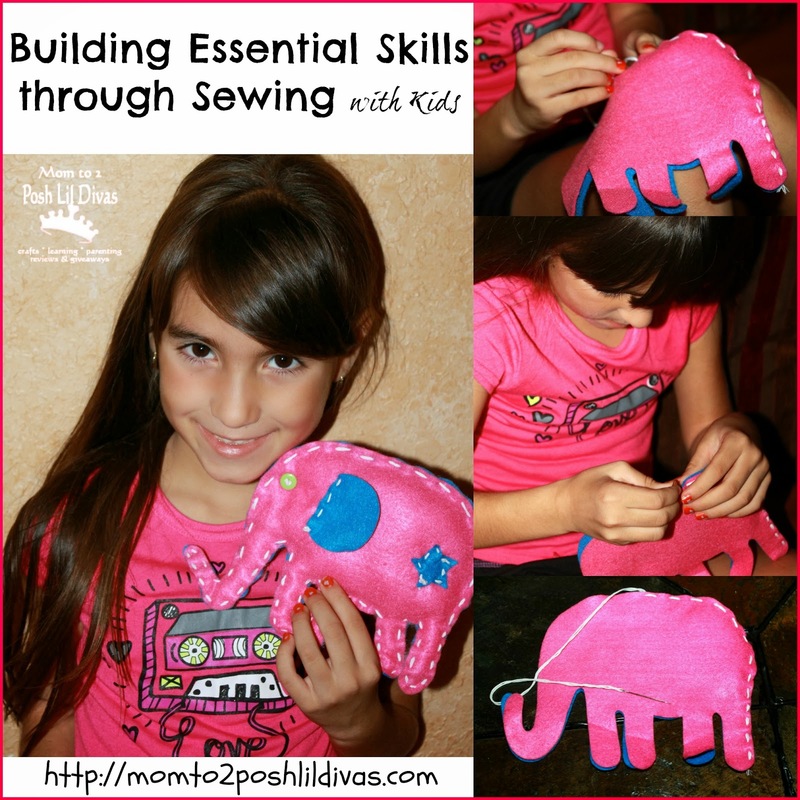 Aside from the obvious benefits of knowing how to sew because it is a practical life-long skill it is also a great way to help develop your child's hand/eye coordination and fine motor skills. Sewing is also a great way to boost their level of concentration, organization and planning skills and their ability to follow directions. How does a non-sewing Mama like me teach my curious girls how to sew and encourage them to tackle a project all their own? I had a little help from the ALEX My First Sewing Kit. 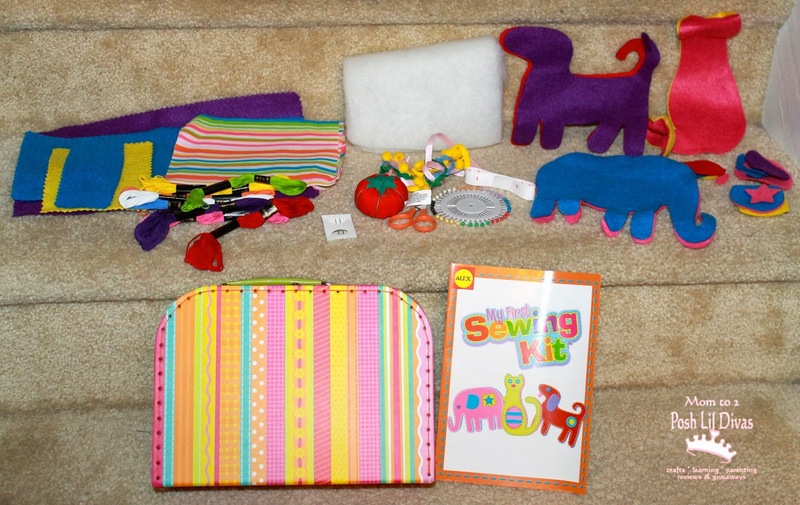 This kit is packed with everything you need to tackle some fun first sewing projects including pre-cut felt, stuffing, fabric, needles, scissors, measuring tape, straight pins, buttons, rick rack, a thimble, a pin cushion and more. Our first sewing project - making the adorable stuffed animals of course! I worked with each Lil Diva, one-on-one, teaching them how to do a simple stitch. They caught on quickly and took the project very seriously. They really took their time, concentrated on each stitch and worked diligently to complete their stuffed animals. It was wonderful to share this first sewing experience with them. Having the kit made it so easy - everything was right at our fingertips including the easy to follow instructions. The kit has a suggested age of 7+ years but my 6 year old was able to do it with little assistance from me and she did a great job - especially for her very first sewing project. The kit comes in a cute and colorful carrying case that not only provides great storage but can easily be used to take everything on-the-go as well. There are lots of sewing options provided in this compact kit. 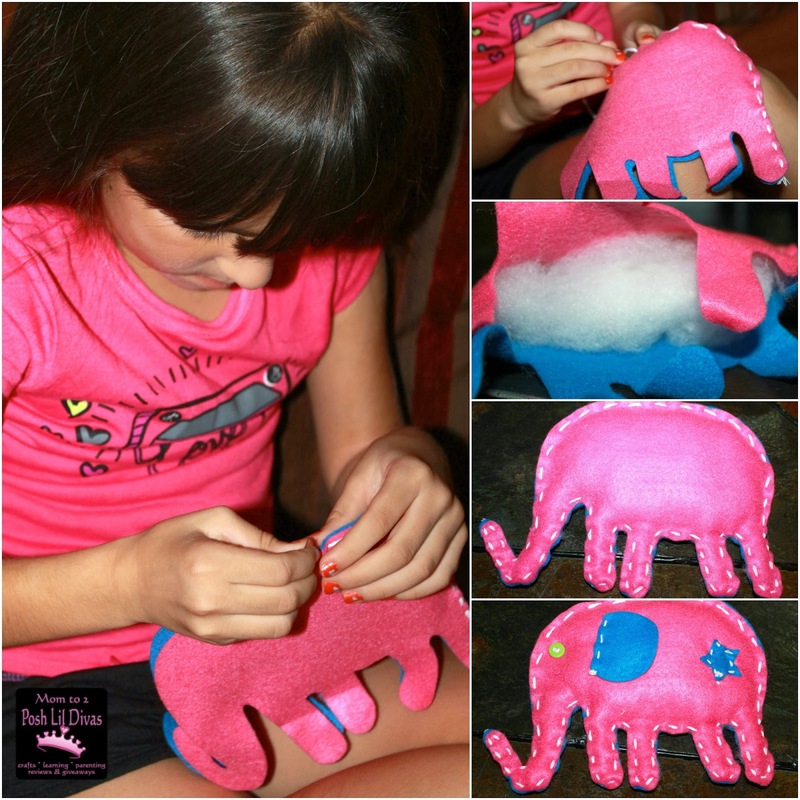 The Lil Divas can't wait to try their hand at something else and with the help of our ALEX My First Sewing Kit this non-sewing Mama actually feels like it's something I can help them do. While they are building all those essential skills, I'm building a few of my own. So while I may not be ready to sew our own clothes I can certainly feel proud of the new stuffed animals (made by our own hands) in our house. Who knows - maybe I'm helping nurture a future clothing designer or at least two sewing proficient Lil Divas. 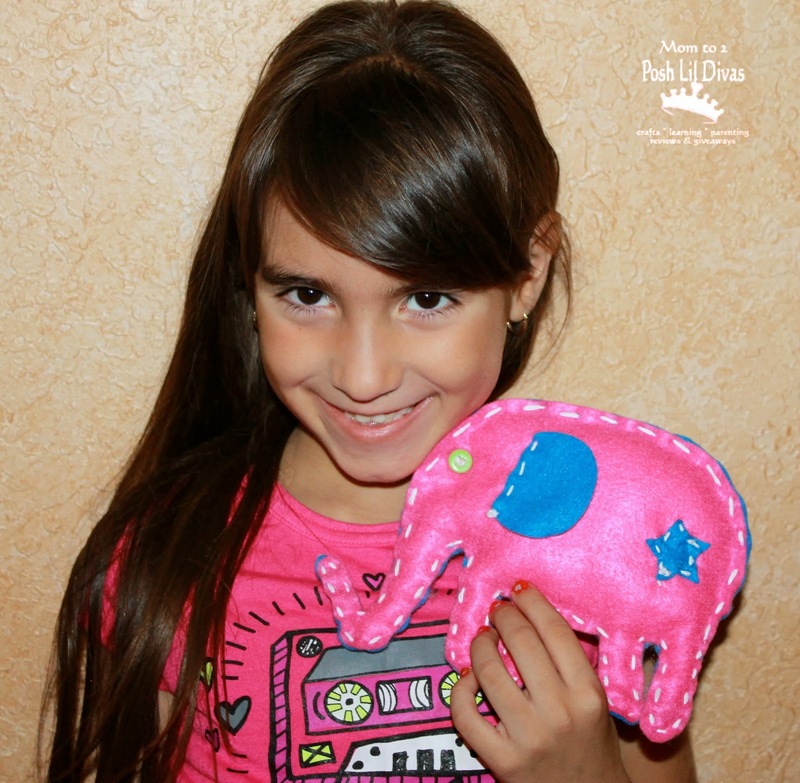 Have you introduced your children to sewing? What types of sewing projects have you tackled? I'd love some ideas for some simple, kid friendly sewing projects we can try together. I haven't taught my girls sewing yet, but they're always right by my side when I'm sewing. I know I will teach them once they're a little older. 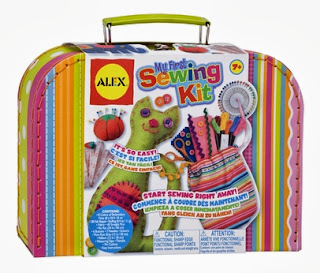 This kit is so awesome and looks like a great first sewing kit! We have this kit and my daughters love it! Such an important skill to learn. Thanks for sharing. I have been eyeing that kit for a while - I think it has such cute projects! I love that pink elephant! that turned out so cute! 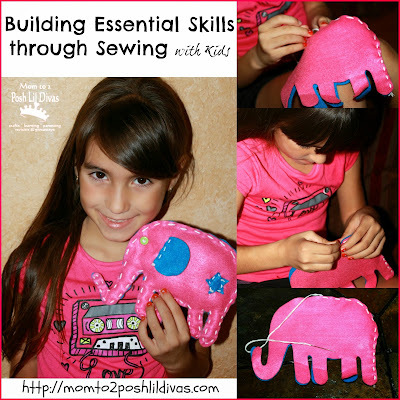 what a fun project that teaches great life skills! you never know when you might need to mend a small rip or re-attach a button. she did great! Oooh, what a brilliant gift idea! I wish I'd had someone teach me these sorts of skills at their age - maybe I wouldn't be such a domestic disaster as an adult!